Want your May to magically become a winning one? 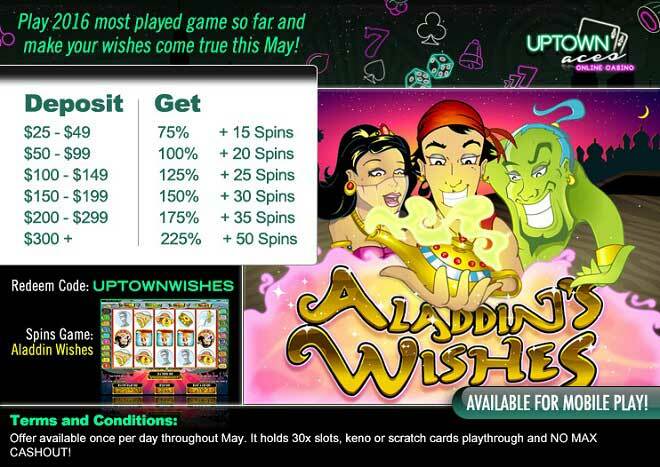 How about making a deposit of as little as $25 and spinning the reels of our most played slot with up to a 225% Match plus 50 Free Aladdin's Wishes Spins! Grab your magic carpet and make your way through May a winner! The wild Aladdin symbol appears on the second, third and fourth reels to fill in any winning combination The Scatter Lamp will help you win more when you enter the bonus round where hidden cash and up to 25 free spins, each with a 2x multiplier, are all part of the magic times! Make May a magical winning time when spinning our most popular slot with up to a 225% Match and 50 Free Spins!